Costa Rica is a country rich in sounds - a recordist's paradise! Wake up in the morning to a Howler Monkey's bellow, and eat lunch at a local Soda while the Olive-throated Parakeets squabble in the trees overhead, then retire to the serenade of the crickets and tree frogs in the bosque outside your window! Every moment in this lush tropical country is awash with exotic sounds. Take our virtual vacation and listen for yourself! I've broken this site into several pages, each accessible by clicking on its page number at the bottom. If you want to go back to a previous page it's usually faster to press the "back" button on your browser than to use the page link - that way the page doesn't have to reload. To hear the sounds, just click on the highlighted words and wait while your browser downloads the sound - this can take a few minutes for a large sound - generally your software will play the sound automatically when it's finished downloading. You can go on to other parts of the page or to other pages while your computer downloads a sound - it will still work in the background. Click on any small picture to see a larger version. If no larger version is available, your curser will not change to the pointing hand. Have fun! Practically the first bird I heard after we got situated in our hotel in San Jose was the omni-present sound of the Clay-colored Robin. This bird is everywhere! I don't mean everywhere in San Jose, I mean everywhere in Costa Rica. He's the National Bird, and his song is quite like an American Robin's. He's the National Bird because his singing is synchronized with the start of the rainy season, and the farmers were quick to notice. This one was recorded singing in a tree at La Fortuna, but they seem to sing quite the same everywhere. Here's an example of what I call this bird's "Mono-Duet". It sounds like two birds duetting, but is only one bird using his two syrinxes creatively! Click here to see a spectrogram of this call for the scientifically curious. Listen! Somewhere in the high canopy overhead, maybe in that Cecropia tree, there's a Three-wattled Bellbird! We almost never get to see him, but hearing him is enough. The combination of squeaky hinge and that BONG! It's an unmistakable sound you'll never forget! Bellbirds live side-by-side with one of the most spectacular birds in the world, the Resplendent Quetzal, a bird so beautiful that the ancient mesoamericans often revered it as a demigod. They can both be seen in the Bosque Nuboso (Cloud Forest) in Monteverde and Santa Elena. 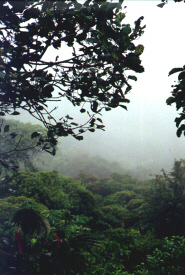 We found Santa Elena more enjoyable than Monteverde and more pristine. There's a great little "soda" at the entrance to Santa Elena preserve where you can get breakfast and great coffee and watch six or eight species of Hummingbirds feed at your table! While you're in the cloud forests you will hear Grey-breasted Wood Wrens, and what a treat they are - loud, clear and melodic - they're one of the singing stars of the forest. Here's a second example. This is the froggy that came to visit. She's lookin' at me over her shoulder kinda like Lauren Bacall, isn't she? Kinda coy! She was an inch long or so, and kept Becky company in the shower stall in our room at La Fortuna! Frogs are everywhere - you could easily (and many do) spend long trips just checking out the frogs. Click here to hear the night sounds around La Fortuna. That Becky, she's a trooper - I ask her to hold a 2½ inch beetle for the camera and she does it! This guy came visiting one evening in our room at Manuel Antonio. If you don't like bugs and frogs and birds and reptiles, then Costa Rica may not be your idea of paradise. It's pretty close to my ideal, though, and I'm sure any other biologist/loony would feel the same. As I've said in other parts of this, every moment was, for me, a thrill - a new frog, a huge beetle, a new strange call shooting from the forest - like a grand puzzle all day, every day. You are the number person to love this page since July 1st!